The richest Malaysian today is none other than Mr Robert Kuok who despite having a small dip in his fortune is still at the peak with wealth amounting to $11 billion. He is of course most fondly remembered as the Sugar King having made and started his empire in the sugar cane and sugar industries. At one time, Robert Kuok controlled some 10% of the world’s sugar supply. Coming close in second is T Ananda Krishnan or A-K in short. A-K’s wealth is worth is $7.4. A-K’s wealth is widely attributed through his ownership of Measat and Maxis, the satellite and telecommunications leader in Malaysia. Measat of course is the operator of Astro. Hong Leong Group’s Executive Chairman Tan Sri Quek Leng Chan meanwhile sits on the third spot with a wealth of $5.3 billion which is less than 2015 but his position remains intact. This is a position he held the year before where he holds a majority stake in the Hong Leong Group and the sale of some businesses as well as the recent acquisition of EON Capital. Quek is involved in real estate and food businesses as well. Quek enjoyed success through the Hong Leong business which was started back in the 1920s by his father and has 2 other brothers. Today, Hong Leong has grown to become one of the large banks in Malaysia particularly with the recent merger with other banks. Tan Sri Dr Teh Hong Piow is never known to be a man who likes the limelight. With a net worth of $4.65 billion, Teh is associated with his stake in the third largest banking group based on assets in Malaysia, Public Bank Berhad. Known for being a self-made billionaire where he started out as a bank clerk, Tan Sri Teh is an inspiration to many after establishing Public Bank in 1966. Today, the bank is seen as one of the most profitable organisations in the region as well as among the most stable. His businesses has since expanded into other countries in the region which include Cambodia, Laos, Sri Lanka, Vietnam, Hong Kong and China, all of which are performing extremely well. Tan Sri Lee Shin Cheng of IOI Corporation follows next where he wealth amounts to RM4.6 billion. Together with his 2 sons, Datuk Lee Yeow Chor and Lee Yeow Seng, they control the IOI Group which is known for its flagship property development projects and in the plantations sector. Tan Sri Lim Kok Thay is the chairman of Genting Group which is often known for its casino and entertainment business. The son of self-made billionaire, the late Tan Sri Lim Goh Tong, he has since grown the company by leaps and bounds since taking over the helm. Today, Genting Group owns gaming business in Las Vegas, Singapore and other countries. As one of the top entertainment and gaming companies in the world, Resorts World has been enjoying a lot of success especially with the 20th Century Fox theme park as well as the recent acquisition of Crystal Cruises. Tan Sri Lim is currently the sixth richest man in Malaysia with a net worth of $2.25 billion. This was a drop from his previous ranking at fourth a year before. Tan Sri Yeoh Tiong Lay has a net worth of $2.3 Billion. This puts the 86-year old tycoon at the seventh spot of the richest people in Malaysia. Yeoh Tiong Lay or YTL is no stranger to the Malaysian business sector. It has some of the top properties in the region where he enjoys his wealth mainly from real estate and in the construction sector. Tan Sri Yeoh was 6th in the list in 2015 and this was attributed by the economic downturn recently. Besides that, YTL has businesses in power and energy through Singapore’s PowerSeraya while it is involved in the telecommuncations sector as well. Tan Sri Yeoh’s eldest son is Tan Sri Francis Yeoh who is currently running the company. 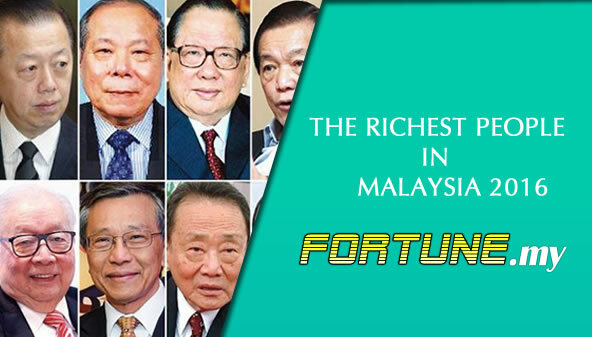 Tan Sri Lau Cho Kun is the 8th richest man in Malaysia. He holds a net worth of $1.58 Billion where he manages the Hap Seng group from East Malaysia. The man from Sabah dropped a spot from 2015 but has since been earning a lot of revenue through the property arm which has been hugely successful in recent years. Hap Seng is one of the leaders in the plantation and fertilizer industry coming from the agricultural sector. Tan Sri Lau has a controlling stake in Hap Seng which was inherited from his late father, Tan Sri Lau Gek Poh. Today, Hap Seng has diversified into other business areas and prominent sectors including holding the distributorship for Mercedes Benz in Malaysia. Tan Sri Syed Mokhtar AlBukhary is the only bumiputera tycoon in the top 10 richest Malaysians. He has a net worth of $1.55 Billion where it has been said that Tan Sri Syed owns almost every industry for every Malaysia. Known for being a self-made billionaire, the high school drop-out held on to the spot in this ranking for 2 years now. This is despite the drop in his fortunes due to the volatility of the market recently. It has been reported that his companies actually account for about 10% of the corporate debt of Malaysia. Tan Sri Syed owns Bernas which is the main rice producer of the country apart from having interest in automotive, transportation, real estate and education. Tan Sri Surin Upatkoon is quite a newcomer to the Malaysian list. With a net worth of $1.14 billion, the 66-year old businessman was ranked 15th in the Thailand list in 2015. It was his selling of a 10% stake in InTouch, a Thai telecommunications company that saw his fortunes rise. However, it would be his stake in Magnum Corporation, one of the largest gaming companies in Malaysia which would draw any interest as it has been enjoying a lot of profits in the last few decades. Today, Surin’s association with Multi-Purpose Holdings ensure that he continues to enjoy his wealth. A Thai national, he has moved to Malaysia since 1965 where he studied in Penang and found employment there.